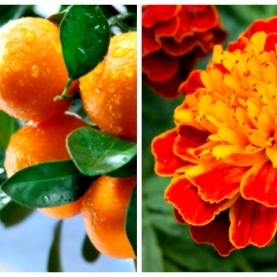 We have combined Tagetes Essential oil with Tangerine Essential oil! The result is a beautiful blend that is not only uplifting but also protective in many ways. The aroma of this blend is bright, cheery and very uplifting! Tagetes is a beautiful essential oil that despite its wonderful aroma and powerful properties is really not well known or well used. Tangerine is a wonderful citrus essential oil that is uplifting and helps us to connect to our inner child and joy. This blend is photo toxic because of the tagetes, so care must be taken if using in a topical or creme blend. it is beautiful in a diffuser and actually the power of this blend lets in the energetic realm. Tagetes is distilled from the Marigold plant. Marigold deals with death, rebirth, and transitions. It is also referred to as "Herb of the Sun". Tangerine deals with inner joy, childlike innocence, and abundance. PS: It is a great linen spray as it repels insects, including bed bugs. You may want to try this blend in combination with our Marigold Flower Essence for an additional energetic benefit!